Shorts have compression to keep the legs snug so they won't ride up. High Quality Triathlon -Shorts! All Sizes available! Quick Dry Triathlon sewn in chamois crotch pad is unique for Triathlon garments, with a single density, perforated foam which guarantees optimum protection, while the highly elastic fabric provides total freedom of movement and excellent fit. The pad is designed for optimum fit in the crotch and between the legs with a three piece pad with baseball type stitching. You will love this triathlon pad! This triathlon short is made out of supremely soft nylon/Lycra spandex fabric with four way stretch. It is very high quality, won't fade or disintegrate. The seams are flat-locked for long live and maximum stretch. The waist is elastic cover-stitched and the legs are ideal length and will not ride up during exercise. Try this unique pad just for Triathlon garments, with a single density foam which guarantees optimum protection, while the highly elastic fabric provides total freedom of movement and excellent fit. Three piece pad with baseball type stitching. Anti- Chafe Design - Anatomically Designed Chamois Pad that is lightweight and perforated. This Elastic Interface pad is designed by Cytech. It is made with a Quick Dry fabric. The engineered pad is thin on the edges with an extra amount of thickness on the sit bones. 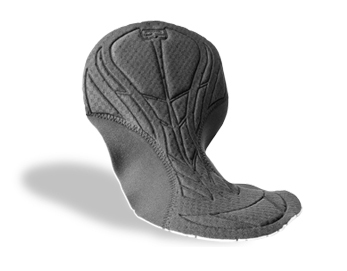 This pad is unique for multi sport garments, with a single density foam that is perforated for maximum air flow. This guarantees optimum protection from chafe and fatigue. The highly elastic fabric provides freedom of movement and excellent fit. It is a three piece pad with baseball type stitching. These tri-shorts are very comfortable!!! The legs stay down without uncomfortable grippers. So glad I bought these!!! I tried other tri shorts but these were way more comfortable and fit better! These shorts fit great and are very comfortable! Went from the pool to bike just great, and if they were still wet by the time I started my run, I didn't notice. I wore these for all my bike training once I got them. I'd been biking in regular shorts, so having padding for the first time was wonderful. I have been riding for years and purchased a Selle Anatomical seat several years ago. I love the seat but found I needed a much thinner pad so I went with a thin triathalon pad - one 2mm thickness throughout. This was fine for a long time. I recently lost 60 pounds and the sit bones were needing some padding but I did not want the bulky pad up front. I discovered this multi-thickness pad which gave me the thicker sit bone padding I needed and the thinner front pad. It is the perfect combination! I am more than comfortable for those short 30 milers to the century length. Cannot recommend them highly enough! I've been wearing them to do indoor spinning class instead just letting them sit in the closet until my first Tri. They feel great, the fabric doesn't wick away a nice as regular bike shorts but they will work very well for a triathlon event. I am a plus size women. I wore these for my first triathlon. They looked and felt great. I didn't pay extra for the larger size. What a treat. Great price too. Bought these for my first triathlon. The padding covers too much area to work for the swim so I'm only using them for the bike. I've worn them for a few rides (up to 17 miles) and love them! Very comfortable perfect length no riding up. There's no pocket but not a big deal. Hands down my favorite cycling shorts. I love that these shorts have a drawstring waist. Also the waistband sits a little higher than all of my other cycling shorts but this is good because it prevents the waistband from rolling over. I've never found a pair of bike shorts that weren't too tight on the bottom of the leg. I love how comfortable these are and that they don't bind on my legs. These are perfect for an indoor triathlon. I might appreciate a discreet fanny pocket on this model.